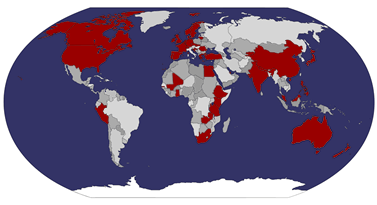 Talking about a World Conference, these countries will all be present at the 2012 World Appreciative Inquiry Conference in Ghent. Australia, Belgium, Bermuda, Canada, China, Croatia, Czech Republic, Denmark, Egypt, Ethiopia, France, Gambia, Germany, Ghana, Greece, India, Ireland, Japan, Kenya, Kyrgyzstan, Lithuania, Luxemburg, Malaysia, Mali, Nepal, The Netherlands, New Zealand, Norway, Peru, Philippines, Portugal, Qatar, Romania, Singapore, Slovakia, South Africa, Spain, Sweden, Switzerland, Tanzania, Turkey, United Kingdom, United States of America, Zambia. unfortunately brazil and croatia are missing on the country map while you have participants from there; i didn’t check the rest. Thanks for noticing! Cool that you will promote! See you in Ghent next week!